Globalist-funded Prachatai the recipient of Globalist-funded prize. Bangkok, Thailand May 14, 2011 - As true evidence that the power and legitimacy behind the global corporate-financier oligarchy is nothing but absolute theater, Thailand's "Prachatai," a National Endowment for Democracy funded propaganda outlet serving the agenda of globalist Thaksin Shinawatra and his "red" color revolution, has just been "bestowed" the International Women's Media Foundation "Courage in Journalism Award." Prachatai's webmaster, Chiranuch Premchaiporn, along with Adela Navarro Bello of Mexico, and Parisa Hafezi of Iran are described as having "shown extraordinary dedication covering violence, corruption and social unrest in their countries." 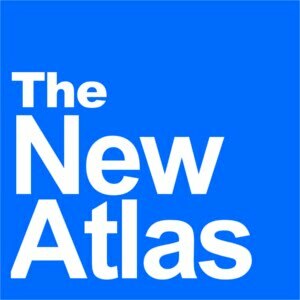 A quick look at Premchaiporn's NED funded website reveals links running off to Soros-funded "Open Democracy," Soros and Ford Foundation funded "Global Voices," the globalist International Institute for Strategic Studies (which includes Robert Blackwill, former Thaksin Shinawatra lobbyist), as well as a myriad of pro-Thaksin, pro-globalist, pro-red shirt websites that form the nucleus of the movement's intelligentsia, in and out of the country. These include Bangkok Pundit, New Mandala of the Australian National University, and Asia Sentinel which frequently features the writings of Giles Ungpakorn, Marxist, red-shirt leader, and the author of the "Red Siam Manifesto." NED, with its incredibly nefarious history of foreign meddling, derides the legitimacy of all who willingly accept their funding. NED consists of corporate-financier and political interests, not humanitarians. Prachatai itself features articles myopically obsessed with Thaksin's red-shirt movement and the latest news from various international arbiters including Freedom House, Amnesty International, and Reporters Without Boarders. Prachatai portrays Thailand as a repressive nation, glossing over the fact that all the victims it reports on are linked to Thaksin Shinwatra's foreign-funded bid to seize control of the nation. They also feature hit pieces including an attack on Land Destroyer itself, penned by a Mr. "Gerrard Winstanley," an obvious reference to the 1600's collectivist who sought the elimination of "private property and the aristocracy." 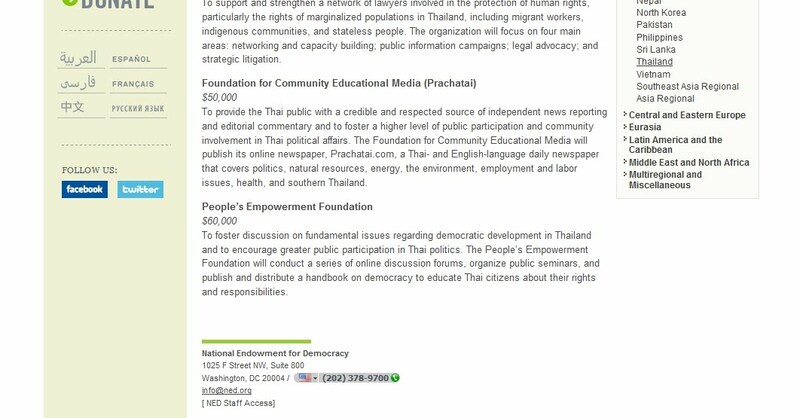 Whatever Prachatai is, it certainly isn't the "credible and respected source of independent news reporting and editorial commentary" the National Endowment for Democracy claims it is. In fact, NED itself is not what it claims to be either, as it is lined by "Neo-Conservatives" and corporate interests rather than humanitarians. Prachatai is yet another nexus and leverage point being used by the forces of corporate-financier globalization in their current wave of destabilization sweeping the Middle East, Eastern Europe, Southeast Asia, and onto China itself. Similar outfits, and certainly identical rhetoric prepared the groundwork for the entire "Arab Spring," the war in Libya, and even the inroads being made to destabilize China. The International Women's Media Foundation (IWMF) in name alone sounds like yet another contrived globalist organization handing out an equally contrived award. 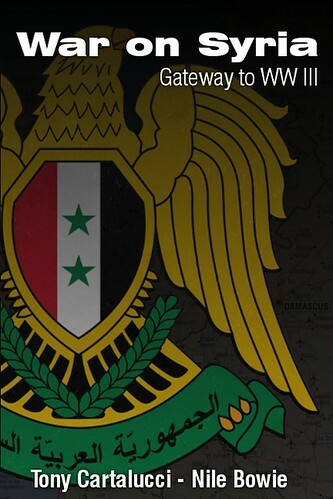 A look at the IWMF's "supporters" vindicates this suspicion in spades. Supporters include: Bank of America, Bloomberg News, the Ford Foundation, LA Times, NY Times, the Carnegie Corporation of New York (also funded the notorious "Ground Zero Mosque" hoax), CBS, CNN, NBC, Sony, The Boston Globe, Chevron, American Express, AP, Hunt Alternatives Fund (also funded the "Ground Zero Mosque" hoax), Merril Lynch, war profiteer Northrop Grumman, Pfizer, Rueters, Time, Hearst Magazines, Ms. Foundation for Women (also funded the "Ground Zero Mosque" hoax), the United Nations Foundation, and Yahoo. This isn't the first contrived globalist award Prachatai has been nominated for. 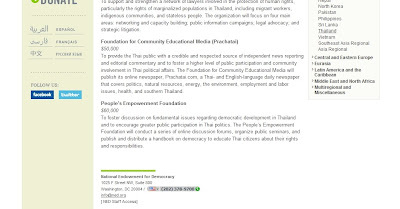 The Neo-Conservative lined "Freedom House" has recently nominated Prachatai for a Deutsche Welle Blog Award. It should be noted that ICG's Kenneth Adelman, former lobbyist for Thaksin Shinwatra, also chairs the Freedom House board of trustees. Such contrived awards created by such transparently self-serving corporate-financier interests are meant to lend the illusion of legitimacy to whomever such awards are bestowed upon. Prachatai without this globalist self-aggrandizing, would otherwise be another opposition website toiling in obscurity and most likely under the radar of the government it claims to be so tormented by. The fact that it is receiving money from a foreign government and actively promoting the subversive efforts of globalist Thaksin Shinawatra and his "red" color revolution, makes Prachatai guilty not of brave journalism, but rather of foreign-funded sedition. It should be noted that this "red" color revolution that Prachatai portrays as political victims of a brutally repressive Thai government is led by globalist Thaksin Shinawatra, a former adviser to the Carlyle Group, who was literally standing in front of the CFR in NYC on the eve of his ousting from power via a bloodless 2006 military coup. Since 2006, in his bid to seize back power, Thaksin has been represented by fellow Carlyle man James Baker and his Baker Botts law firm, the International Crisis Group's Kenneth Adelman and his Edelman Public Relations firm (also a corporate sponsor of the "color revolution college" Movements.org), Belfer Center adviser and IISS trustee Robert Blackwill of Barbour Griffith & Rogers, and now currently represented by Robert Amsterdam of Amsterdam & Peroff, a major corporate member of the globalist Chatham House. Thailand's destabilization and potential regime change by this eager recipient of globalist aid serves as part of the greater purpose of confining China via the "String of Pearls" strategy, and explains why so much effort has been put into Thaksin and his support network both in and out of the country. It is indisputable, between the years of constant corporate and political support Thaksin himself is receiving and the globalist adulation raining down upon the various cogs in his propaganda machine, that we are witnessing a verbatim repeat of what has just transpired in Tunisia, Egypt, Yemen, Libya, Iran, and Syria. Identical networks, rhetoric, and the very same international organizations are complicit throughout all of these nations and quite clearly in Thailand as well. These corporate-financier oligarchs are able to perpetuate this campaign of globalization with the legitimacy wrought from these contrived organizations and their equally contrived "awards." Hopefully we will not have to wait for the US State Department to declare its involvement in Thailand's "red" color revolution, as they did recently regarding the "Arab Spring," before we recognize yet another brazen attack on national sovereignty. For more information regarding Thailand's ongoing color revolution, please visit the Thailand archives.